Enlightenment and the possibility of Physical Immortality are inextricably linked. You want to learn to live a long time? Then you should also work on developing your spiritual connection to the core of your being. Life is full of pain and suffering, and can often be tough to bear. Do you ever wonder if life is worth living? Are you retired and missing friends and family who have died before you? Is there a reason to go on living? Are you depressed because the life you had and people you used to know no longer exists or have died? Do you wonder if there was ever an unfulfilled purpose missing in your life? Would you like to live the years you have left in happiness and with purpose? Is there a spiritual or God centered reason that our lives keep getting longer with each generation? What is our purpose beyond career retirement and being grandparents? How many of us as we get older start to wonder more and more about the purpose of our lives? I've had experiences with enlightenment and studied physical immortality for close to forty years. My conclusion is that there are ways to not only become a happy person, but our lives can be much longer and more fullfiling than we ever thought possible. 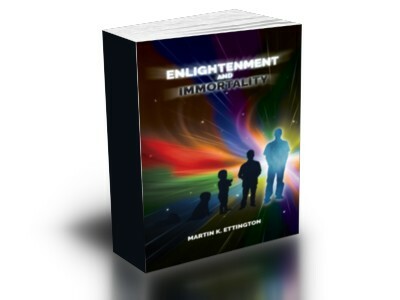 This book on Enlightenment nad Immortality starts with reviewing the Pain and Suffering in our lives, discusses spiritual development with enlightenment as a goal, and also how to determine your Soul's Purpose in life. In later chapters we discuss how Extended Longevity is not only something to strive for, but that physical immortality is tied to the enlightenment process. Spiritual Enlightenment has been taught for centuries and there are many resources and traditions on this subject. As spiritual beings we were put on this earth to develop our spirituality in a continuing evolution. The spiritual development process also has the benefit of helping to increase our longevity. Extended Longevity gives us needed time to continue to improve our connection to the Spiritual source in this life. If we are not taking advantage of our God given abilities to improve our happiness and physical well being then we are missing a significant potential in our lives. This book takes us through the process of understanding where we are, developing our Soul's Purpose on this earth, and the processes for rejuvenation and extended longevity. The Author reviews the extended longevity approaches he has learned and explained in his other books-along with some exercises to improve your overall health and longevity. How do we Lengthen our Lives?